January 2017, summer holiday season down-under, afforded time to build something I’ve been wanting to build for several years, my first Digital VFO. I’ve built a kit Digital VFO with pre-soldered surface mount parts and burned-in firmware, but this was to be a scratch build with Arduino Nano, C code with modifications, and a Silicon Labs si5351 PLL clock generator on a breakout board. I used the wiring map and script from Tom AK2B (modified from one by SQ9NJE ) and uses Jason NT7S si5351 library. The script is simple, supporting a single push-button to cycle frequency increments, and dealing with encoder interrupts, contact debouncing, refreshing the LCD display, IF offset and VFO/BFO outputs. Jason’s si5351 library hides the gutsy device interfacing, giving you a handful of common-sense functions to call… for example, set_frequency() takes as its argument the frequency in centi-hertz (1/100th of a hertz) and the ‘clock 0/1/2’ flag. It couldn’t be simpler. The Adafruit board contains the si5351 and a 25MHz clock (from local IoT supplier Core Electronics). Here’s a video demonstration of the VFO’s features. Tom’s script didn’t compile first time, as Jason’s library had changed since Tom posted his script. Jason had removed one parameter from the init() and set_frequency() methods to simplify things. In Tom’s script I removed the arguments (which were ‘0’ anyway). This was a remarkably simple build experience! The key is the si5351… three clocks, 1-160MHz, all software controlled, in a tiny 10 pin MSOP package, and all for a few dollars. One thing’s for sure, it will be hard going back to quartz. [Postscript 12/2018: Quartz crystals are still favoured for good clean BFOs; but I can’t see any reason other than nostalgia for building a free-running VFO these days]. With the wide range of Arduino breakouts, all sorts of control and monitoring behaviours now become possible — GPS, SWR, power and temperature monitoring for power amplifier stages or linears, sequencing, switching, wifi, bluetooth, packet data links, to name a few. If you decide to implement control of mode and band switching in your homebrew radio’s Arduino controller, a mechanism is needed to pass binary or BCD values representing the active mode and band selections through to the individual control lines that energise the relays for each. The traditional way of doing this is to get the controller to output a BCD 3 or 4-bit nibble on its pins, and use a CMOS/TTL 1-of-8 (74LS138) or 1-of 16 (74LS154) decoder, with an inverting transistor relay driver stage which does the actual switching. You can buy the CMOS version of the venerable 74LS154 1-of-16 IC in surface mount on an Arduino style break-out board to minimise space. 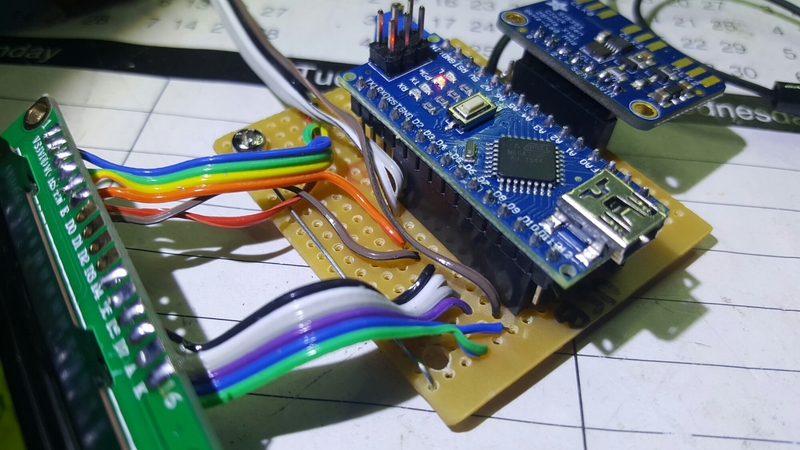 A more contemporary way of achieving the same thing is to use a 1-of-16 decoder driven by I2C. Something like this break-out expander. Or this IO expander. This is preferable because you don’t need to tie up lots of your Nano pins to synthesise a BCD nibble, instead, you pass the selected value to the expander/decoder device via I2C. I’ve not decided how to do this yet. The Hitachi LCD display does not support serial I2C. That means 4 Arduino digital outputs are necessary to convert 4 bit data values to the display, plus 2 control lines. That does not leave enough digital and analogue pins for all the pushbuttons or output lines. A common way around this (without going to the added complexity of IO expander break-outs) is to multiplex a number of pushbuttons switching on a resistive voltage divider, on a single analog input. The script reads the pin and interprets a voltage range for each button. Here’s a circuit and tutorial. I built a rack of 6 momentary on switches (on a receiver front panel I prefer pushing down on a spring loaded switch over pushing in on a pushbutton). The values I got were quite predictable and narrow in range. In the mapping script I used wide number ranges to allow for DC supply variations or drift. a DBM is a switching device in which the diodes saturate when driven with correct oscillator signal level, so squareness of the waveform doesn’t matter much. I decided that low pass filtering was desirable, and plan to add a 5 element Chebychev LPF and a broad-band 2N3904 amplifier stage on at least the VFO clock. Voltmeter: a volt meter is valuable for monitoring battery voltage and health from a portable QRP rig. A voltmeter is one of the easiest additions — simply create a voltage divider with two resistors across the supply rail so that the peak supply voltage is a bit less than 5 volts (measures close to 1024 on the pin using AnalogRead()) and scale the resulting value in software. S-meter: a simple one transistor circuit can sample and rectify IF or audio signal and bring it into the 0-5 volt range for another analogue pin. 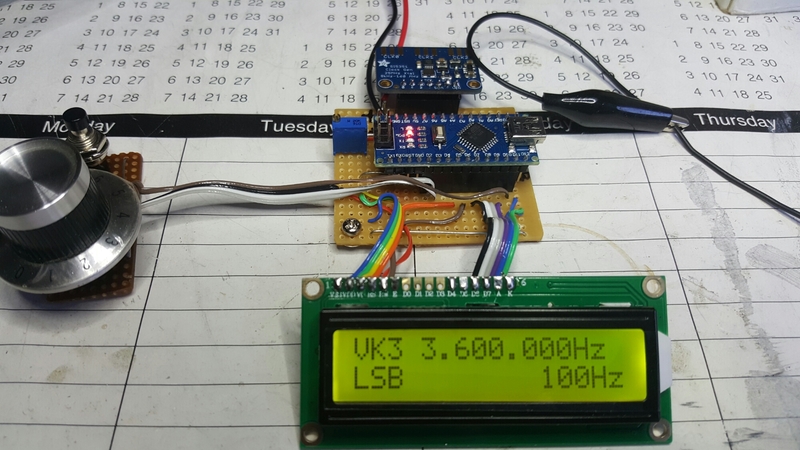 RF-meter: sample and rectify the PA output via a tiny capacitor (a few pF); the Arduino can use the same display space for S-meter on receive and RF on transmit. SWR: a simple directional coupler can supply both forward and reflected indicative voltages, which can be displayed concurrently or alternately. D0 and D1 are used in the serial interface between the Arduino and the PC. The same channel is used by the system’s serial monitor Serial:: which allows a script to trace to the attached screen or other serial device. Seems best to not use these pins. D13 controls an on-board LED through an appropriate resistor to ground. As the Nano boots, D13 is made an output (all the other i/o lines come out of a reset as inputs). And the system software, before it executes whatever you’ve put in setup(); will briefly take D13 high before returning it to low. For this reason this pin should be used for input only, to avoid relays clattering during the first seconds after power up. August 2017: I made up a second Arduino Nano and si5351 VFO/BFO/Controller for another homebrew rig, with some improvements. The post describing the VFO is here. A video of the new rig (receiver only at this stage) is here. March 2018: Have built four or five Arduino Nano/si5351 VFO/Controllers now. A post describing my latest Nano/si5351 controlled QRP rig is here. 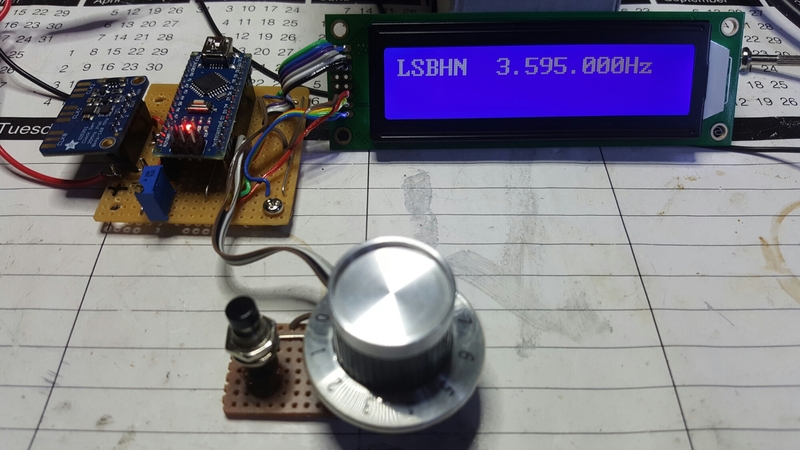 September 2018: Here’s a post on a compact G6LBQ BiTx using an Arduino/si5351 VFO and BFO. November 2018: Here’s the github repo with my code. It works on a HFSignals (VU2ESE) Raduino module. If you use it, remember to execute the Initialiser script once (to set up EEPROM). Further details in the readme and main file header. 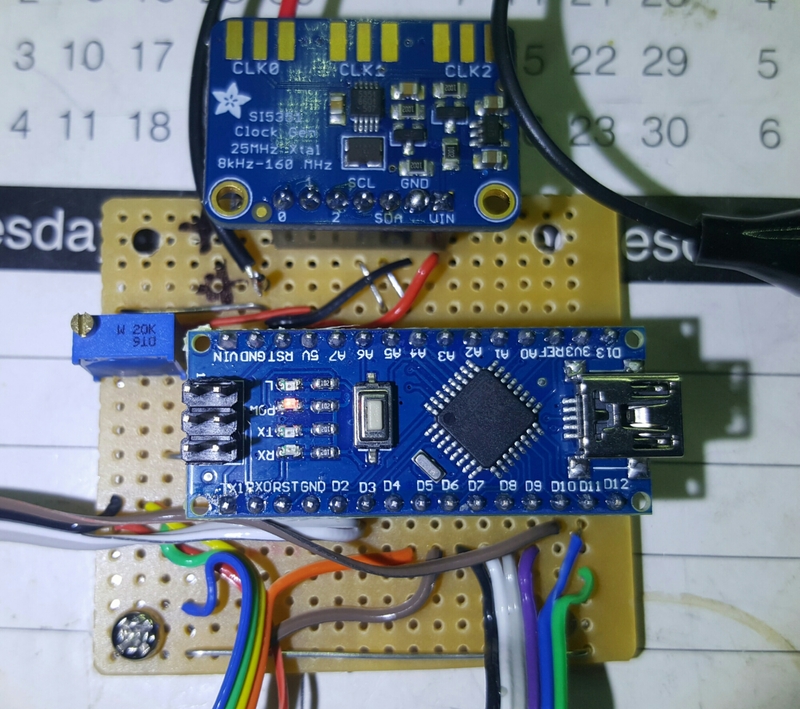 December 2018: And another Arduino/si5351 compact VFO/BFO/Controller and CW Keyer, first stage of a compact multiband SSB/CW transceiver. You’re turning to the dark side! Welcome to the world of digital electronics! There are a number of VFO kits out there now too using this synthesizer. I used one in upgrading my KN-Q7A rig (see http://vk3il.net/projects/kn-q7a-mods/ ). You can do an awful lot with microprocessors in rig control and still use analog for the signal chain. Now you just need to get into designing surface mount PCBs and start using the microprocessors directly 🙂 Even though it costs money to have PCBs produced commercially, it’s pretty cheap these days from China. Thanks David. Its pretty good here on the dark side of digital electronics! I can see a steady trajectory in my projects from 1970s radio craft. I can see the day when i do design one off PCBs with surface mount components, mainly to reduce size for portable rigs. Thanks for your Likes and comments David! 73 de vk3hn. Congratulations Paul, si5351 have more clean output and low distortion than DDS ad9850 / 51. 2nd output can using for local oscilator. Hi Michael, sorry for the delayed reply, WordPress alerts have dropped off. The code is for the Progressive Receiver, not yet posted as it’s not working to my satisfaction. Look at Progressive_VFO.ino on my github page in the vk3hn_si5351_VFO_controller repository. I haven’t flashed this particular controller for probably 9 months but it should still work. You may need to adjust it a bit, and of course, it probably has bugs! Let me know if you need anything interpreted. Regards Paul VK3HN. Sounds good Paul, there’s lots of code and help around. Good luck with your project. Thanks for commenting.